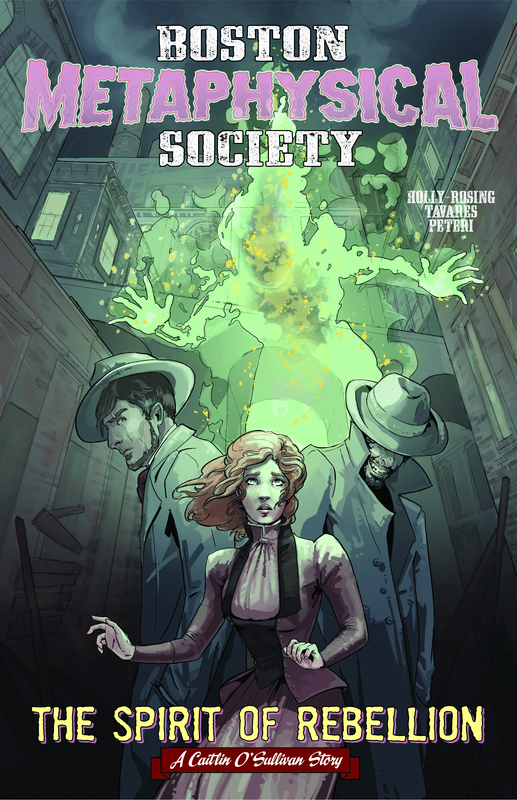 Boston Metaphysical Society: The Spirit of Rebellion Kickstarter is now LIVE! 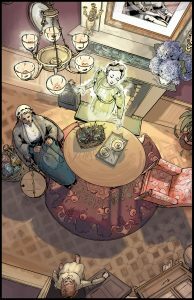 In this standalone continuation of the series, Caitlin is thrown out of the house by her mother. 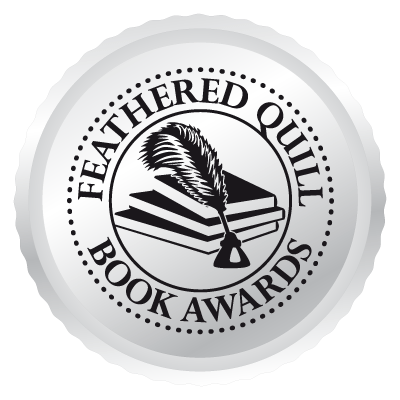 She flees to Philadelphia only to discover a ghost, a rebellion, and perhaps, her destiny. Gwynn Tavares is back on board doing the art and coloring. 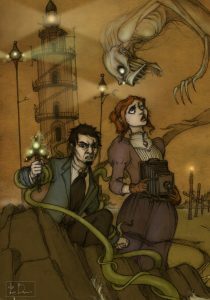 Our first Stretch Goal is a pin-up of Samuel and Caitlin by Tom Brown, the co-creator of the Gothic steampunk series, Hopeless, Maine. It’s official. Boston Metaphysical Society Issue #1 is available to order in the Diamond catalogue today! Order #(STL121941). 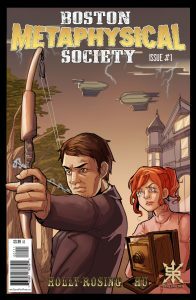 If you hadn’t heard the news, Source Point Press is set to republish the entire six issue mini-series! They are an awesome company and I’m proud to be part of the team. You can learn more about them here. If you missed the Kickstarter, you can pick up a copy of this standalone continuation of the original series from me at Storenvy. Stay tuned for more updates. It’s been a busy year. Wow! What a ride. Thank you to everyone who backed, shared, posted, and tweeted about the Kickstarter for The Spirit of Rebellion. We hit a new high of 564 backers and over $17,000. Because we did so well, I decided to hire a domestic printer to get the books to backers more quickly. That was a fun and easy decision to make. A big thank you to Gwynn Tavares (artist), Troy Peteri (Letterer) and Jason Dube (Pre-press) for all their phenomenal work. For those of you who didn’t get in on the Kickstarter, the book will be available either through me or on Amazon sometime in late April or whenever the last of the packages go out to backers. As for me, I’m prepping things to ship out Kickstarter packages, ordering books, and catching up with admin work. 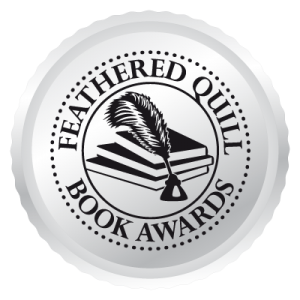 All this is to carve out time to write the next novel AND the next graphic novel. 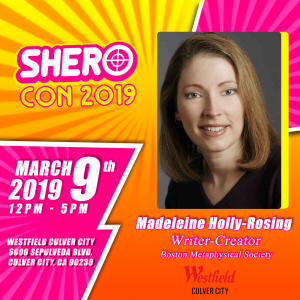 For those of you in the Los Angeles area, there is a new Con that will showcase female creators called SheroCon. And as you probably guessed, I will be there. Come on down and check out some cool stunt women from Black Panther, comic creators, and more! SheroCon. March 9. Noon – 5:00 pm Westfield Mall Culver City. 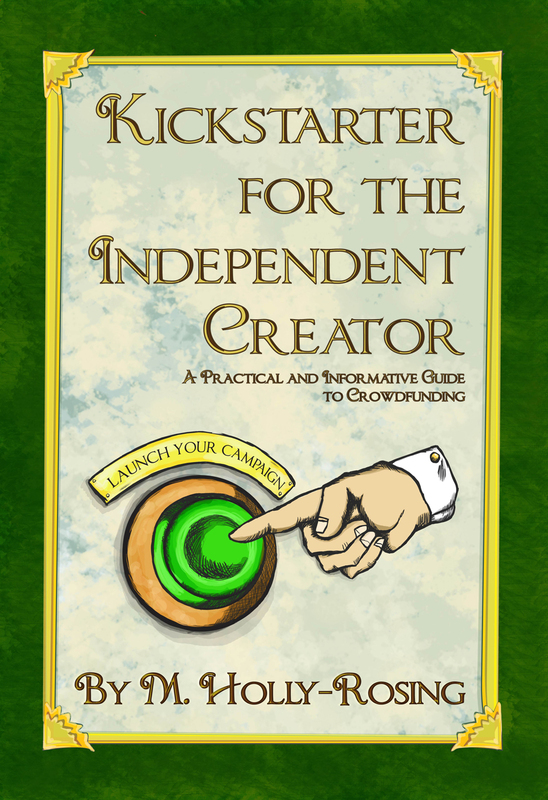 I’ve got some special things planned for the Kickstarter, so look for the official launch on Jan. 23, 2019. Diamond distribution is important to all indie comics as it allows us to reach a larger audience and helps us grow! Which means more comics and stories for you. 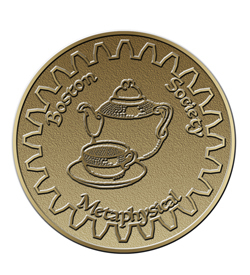 I’ve decided to launch the next Kickstarter to print Boston Metaphysical Society: The Spirit of Rebellion on Jan, 23, 2019. 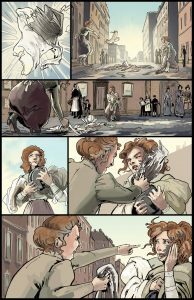 Gwynn is over halfway done on the pencils and has a few of the pages colored as well. We’re discussing the cover right now. Here is the colored version of page 1. We also have a new pin idea winner! Nicholas Diak suggested a teacup or set. So we put together a proof and liked it! It will be in antique bronze, and I’ll post pictures once we have produced them. 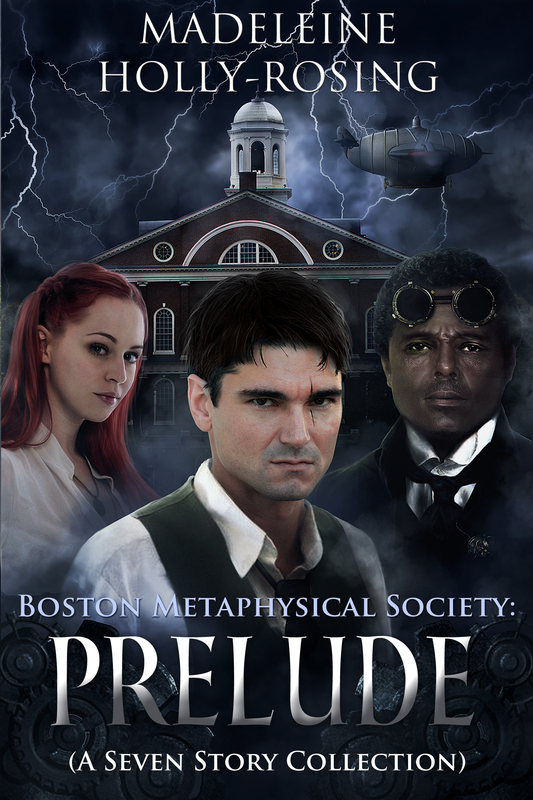 I also just started working on the outline for a series of novels covering the House Wars (my version of the American Civil War) that are set in the Boston Metaphysical Society universe. 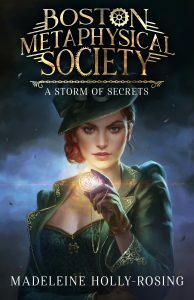 You will get to meet Gwen Warrick (Hunter-Killer), Beatrice Weldsmore (Steampunk Rat) and a host of other characters that were referred to in either the graphic novel, short stories, novels, and my most recent novel, Boston Metaphysical Society: A Storm of Secrets.